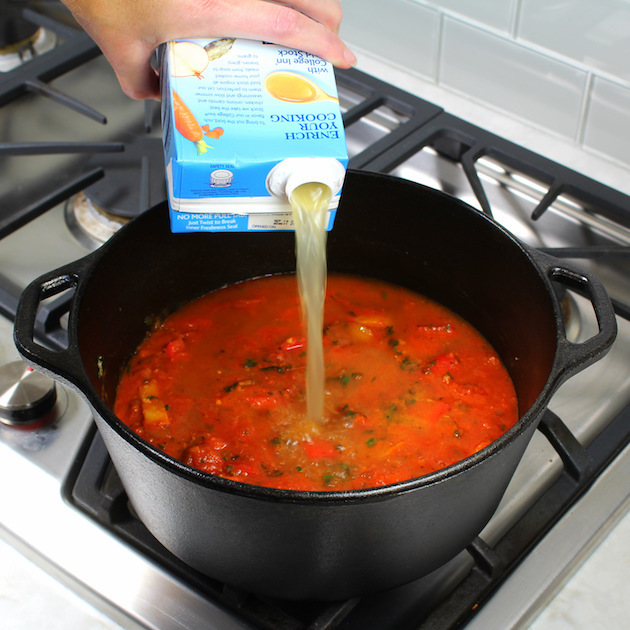 Chicken Sausage Lasagna Soup – sponsored by our friends at al fresco all natural! 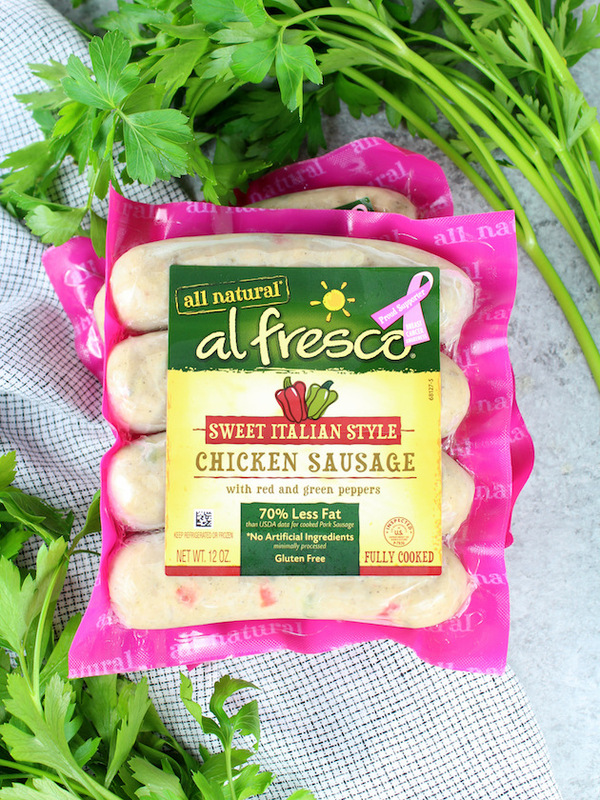 We’re thrilled to partner with al fresco in honor of National Breast Cancer Awareness month. 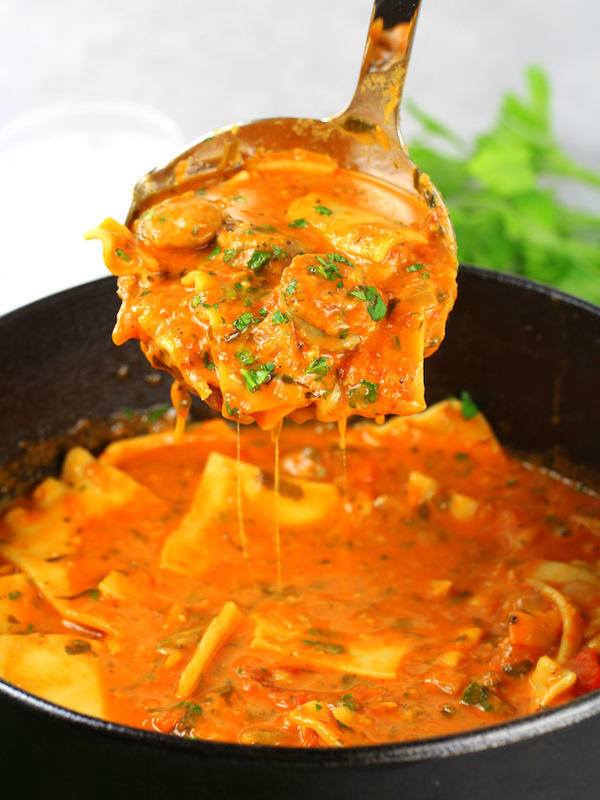 You’re going to love this Chicken Lasagna Soup… This one-pot lasagna tastes just like the traditional version, without all the work! 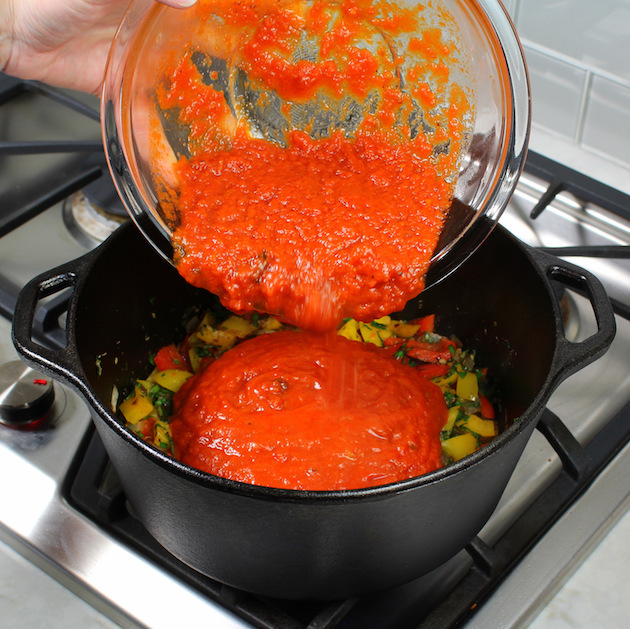 A delicious Italian classic made in a fraction of the time! 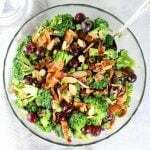 I’m so proud to be a brand ambassador for al fresco all natural… and it’s not just because they have amazing, healthy, easy-to-use products that I adored long before I became a food blogger. 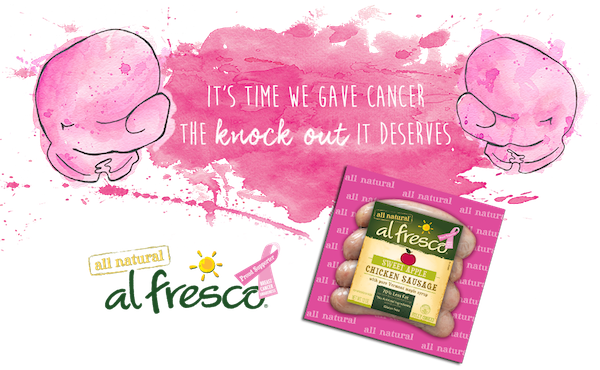 As a company, al fresco is also a big supporter of the fight against cancer, which is a cause that I care deeply about – you can read more of my family’s story here. 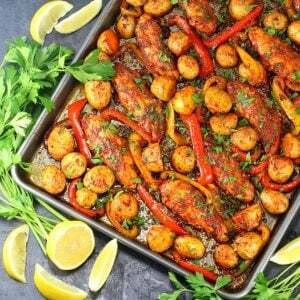 As you know al fresco is all about getting a well-balanced meal on the table as quickly as possible – that’s why they offer THE most delicious precooked chicken sausage on the planet – the perfect swap for chicken in any recipe. 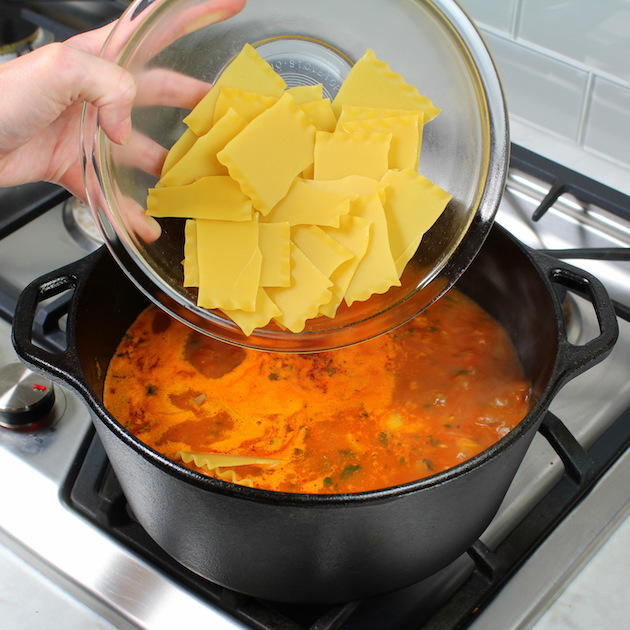 If you love lasagna, but not all the work that goes into it, this Lasagna Soup is for you. Plus, we made it even easier and boosted the health factor by swapping out the ground beef for al fresco’s Sweet Italian Chicken Sausage. Their sausage is loaded with red and green peppers, Italian herbs and spices, it’s lower in fat and calories, it’s gluten free, and has the most delicious flavor! First, slice then sauté the al fresco chicken sausage in olive oil in a large Dutch oven (or soup pot) for 2-3 minutes a side. 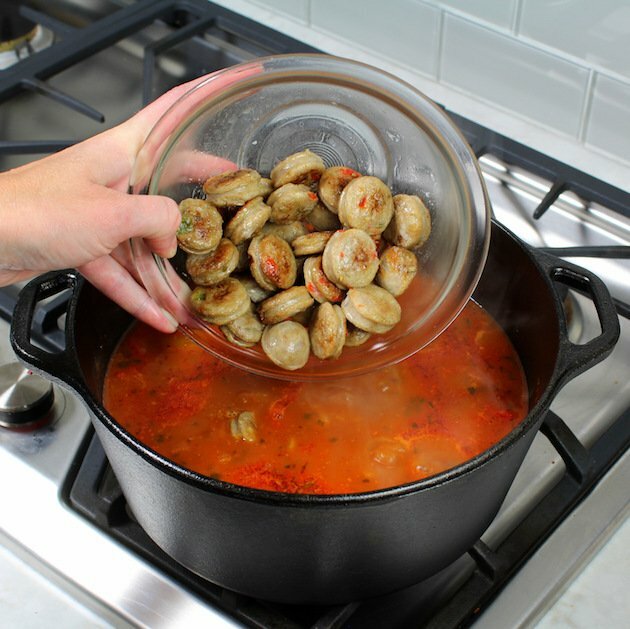 Once the sausage is slightly browned, remove it from the pot and set aside. 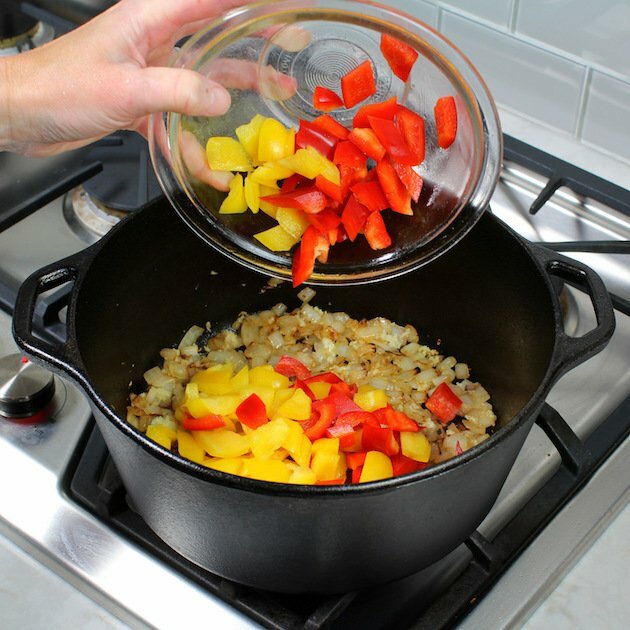 Next, sauté your onions for 4 minutes then stir in your garlic, herbs, spices and fresh peppers, and cook one more minute. Pour in your marinara and chicken stock and bring to a boil. 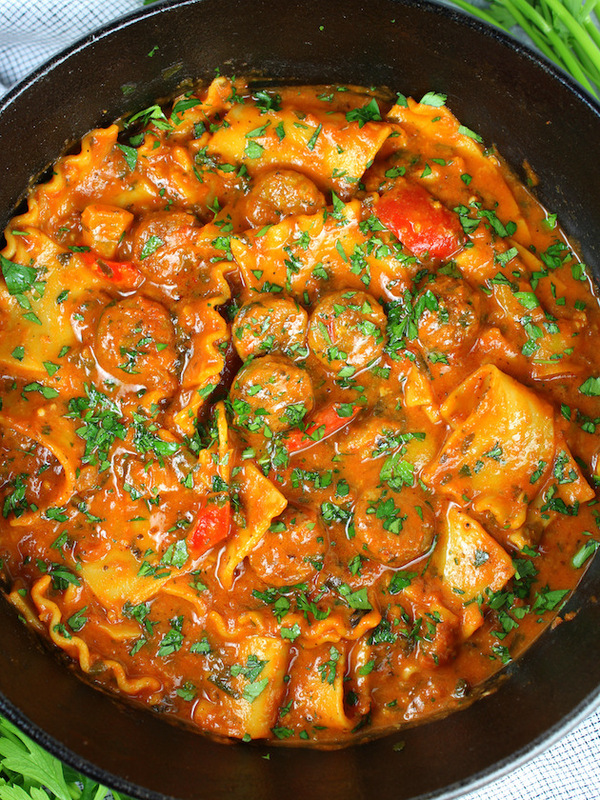 Now add in your broken lasagna noodles, turn down to a simmer, and cook for 10 minutes. 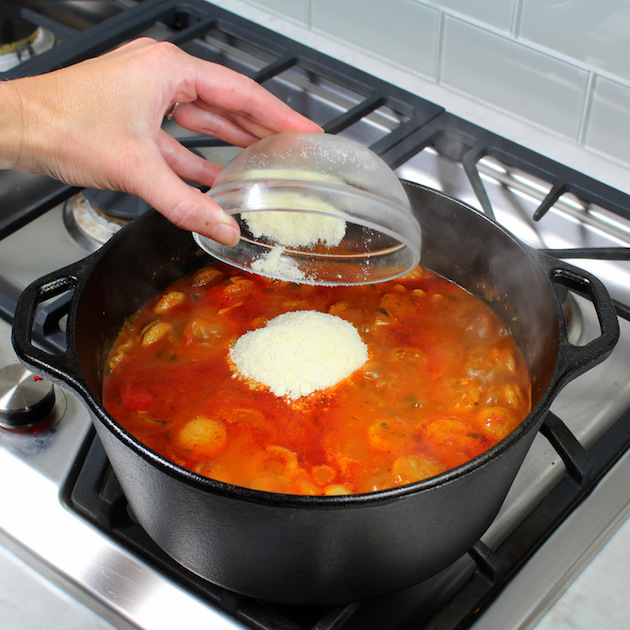 ¼ cup of Parmesan cheese, half and half, and continue to cook the pasta for another 4-6 minutes or until cooked to your preferred doneness. 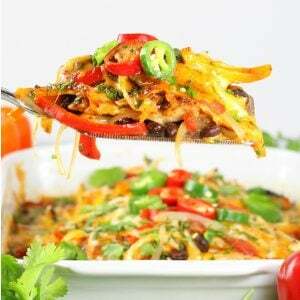 This will add a creamy cheesy element to the dish… just the way Lasagna should be – right!? To make this Italian feast even more “lasagna-esque,” I like to mix up a cheesy herbaceous ricotta topping. 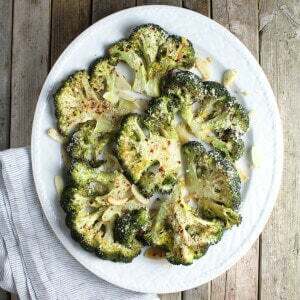 Basically, stir together 1 cup of ricotta cheese, 2 tablespoons grated Parmesan and 2 tablespoons fresh chopped parsley and basil. 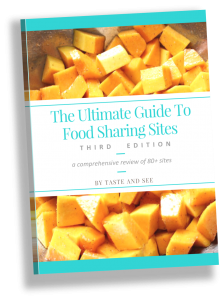 It’s soo good I could literally eat it by the spoonful, and ummm, not gonna lie – I probably did. Seriously, this yummy goodness totally takes this recipe up like 5 notches. Spoon your soup into bowls, sprinkle with some mozzarella cheese, add a dollop of the ricotta yumminess, and devour! 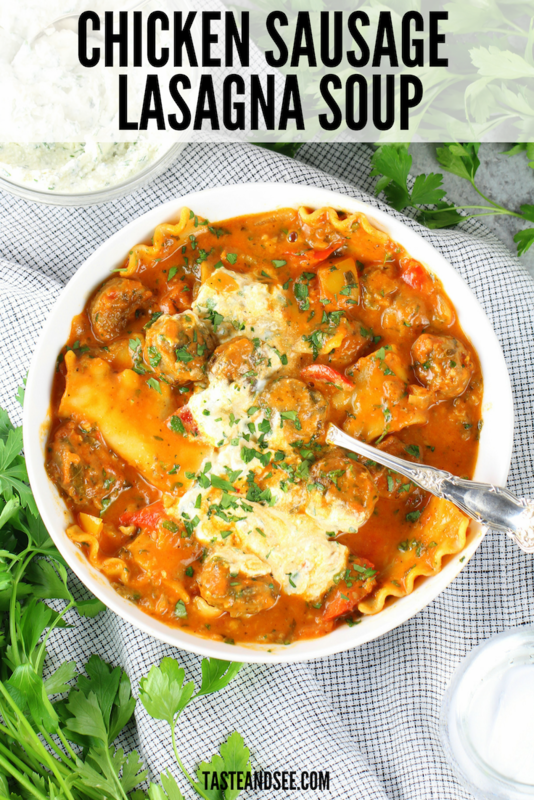 Chicken Sausage and Pepper Lasagna Soup – the most delicious comfort food you’ll be making all season long! And if you like your lasagna a different way, check out these lasagna stuffed peppers! This one-pot lasagna tastes just like the traditional version, without all the work! A delicious Italian classic made in a fraction of the time! 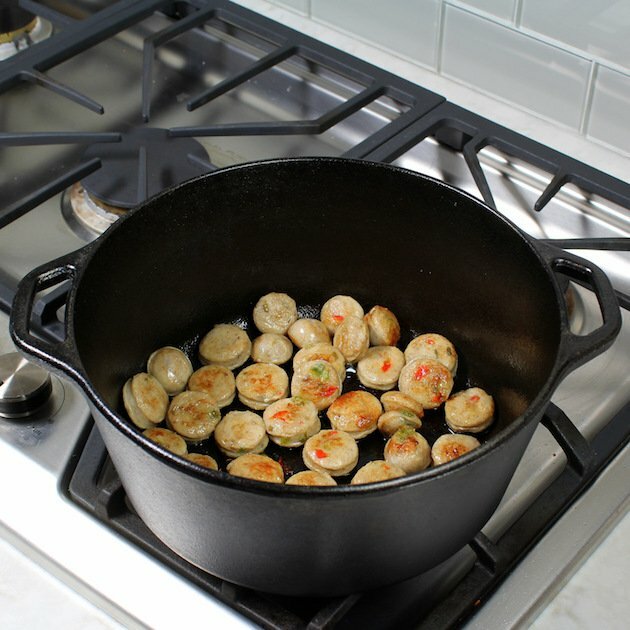 Add olive oil and sausage to a large soup pot and cook/brown 2-3 minutes a side on medium high heat. Then remove from the pan and set aside. 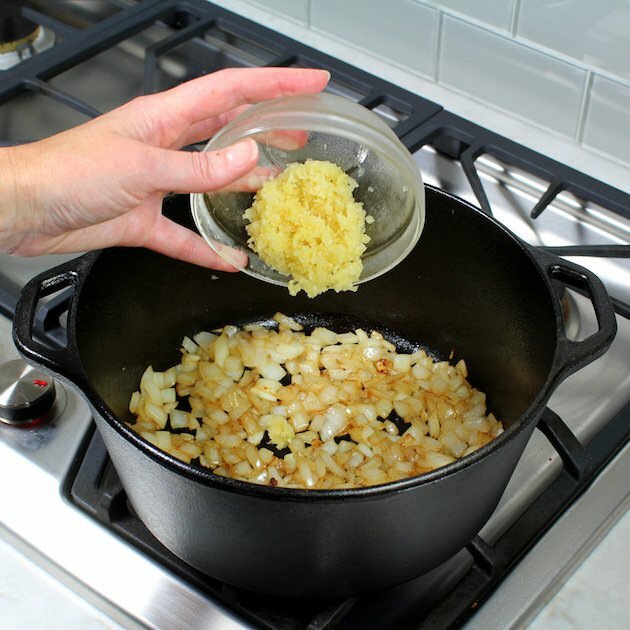 Add onions (and a little more olive oil if needed) to the pan and saute 4 minutes. Stir in the garlic, bay leaves, parsley, basil, oregano, crushed red pepper flakes, salt & pepper, and red and yellow peppers. Cook for another minute. Stir in the chicken stock and marinara and bring to a boil. Now stir in pieces of lasagna and cook for 10 minutes, stirring occasionally. While the pasta cooks mix together ricotta cheese, Parmesan cheese, nutmeg, parsley and basil. To serve, ladle soup into bowls and top each one with a bit of shredded mozzarella and a good dollop of the cheesy ricotta mixture. Finish with some fresh chopped basil and or parsley. The noodles will soak up the liquid in this soup while in the fridge. If needed to reheat add more chicken stock. This recipe will probably make more than 6 servings, depending on the size of each portion! In our house this recipe produced 8-10 servings! Can you make it with the oven ready lasagne? That’s what we have on hand. That should work fine, Jennifer. You just won’t need to cook the noodles in the sauce as long as the recipe states. Good luck! Yayyy! I love hearing that, Kim! Thanks so much! Made this today. Had all the ingredients on hand and a box of broken lasagna noodles I didnt Know what to do with. Amazing. My family loved it. Next time I will Add a little more red pepper flake and less herbs in the ricotta but will make this again and again this winter. That’s a soup that equals a meal! We love lasagna, but it’s so labor intensive. This would be a great replacement! This looks so comforting and good! 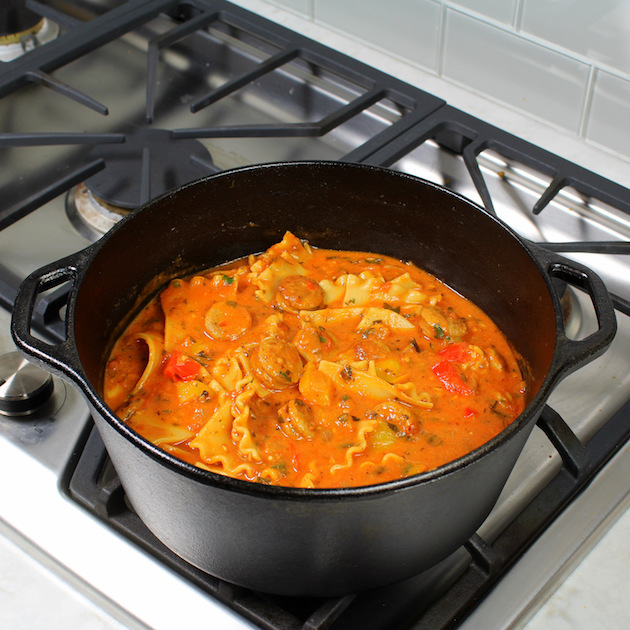 I love pasta, but if I can tuck in on the couch with a bowl of lasagna soup – count me in! Now this looks like a comforting, cold weather soup! I love the concept of making lasagna into a soup. All the flavors but less fuss! Thanks a bunch, Kitty! 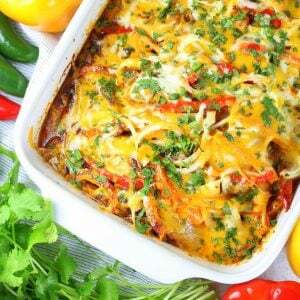 It is just as delicious as lasagna but sooo much quicker and way less work! This looks SO amazing! 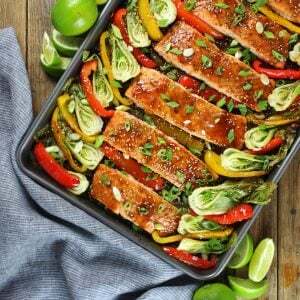 Perfect for a dinner this fall and winter season! I love all these savory flavors! Can’t wait to try this! Printing it out now! You know I am ALL over this. Lasagna that’s not going to take me an entire day to make – SOLD! This is a cause that hits close to home for me and my family, too. 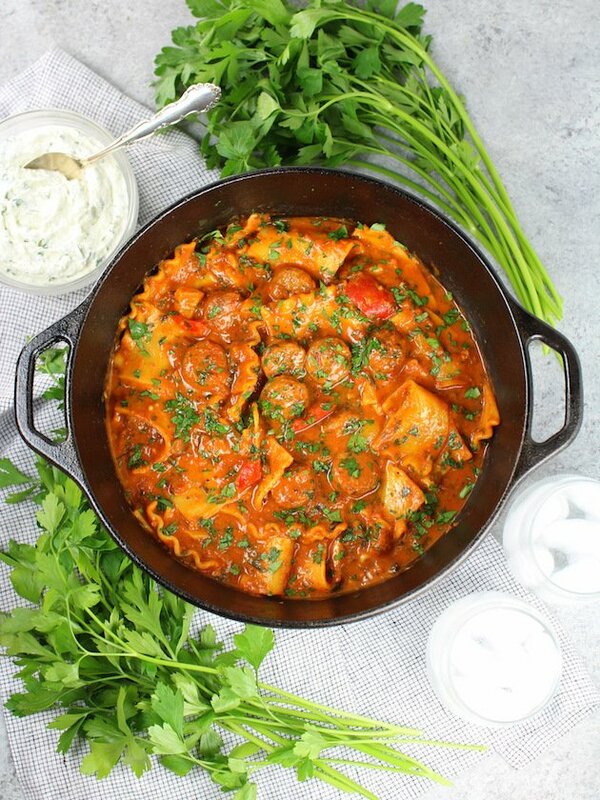 I love how you’ve used the sausages in this soup – what a great way to make a weeknight version of lasagna! I’ll have to keep my eye out for these at the grocery store. Looks like a nice hearty soup for all of the cool nights ahead! We love soups, especially now that the weather has turned cooler. 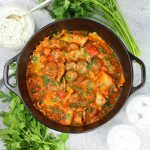 The lasagna soup sounds amazing — I’ve yet to try the Al fresco chicken sausages but they look so good I’ll have to pick some up at the grocery store. This is so smart! I love that I can have lasagna more often now and without all the work. 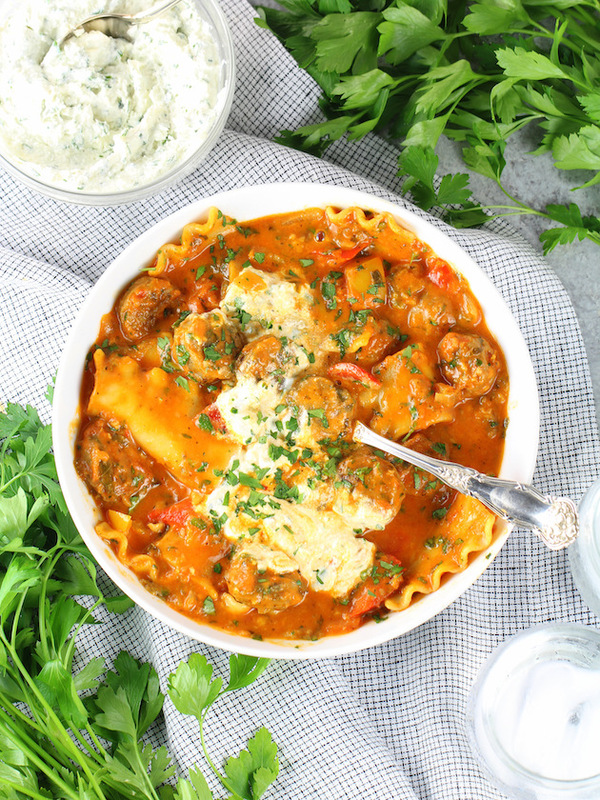 Also love that you used chicken sausage here – Al Fresco is so good and I never thought to swap it in for our lasagna meat! Yum! Thanks so much, Kathryn! I feel the same way… lasagna faster is always a good decision! 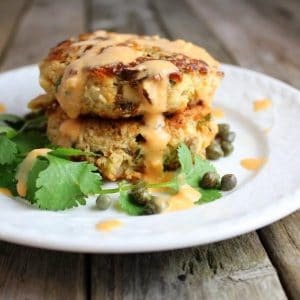 The chicken sausage is such an easy and delicious swap – we just love it! 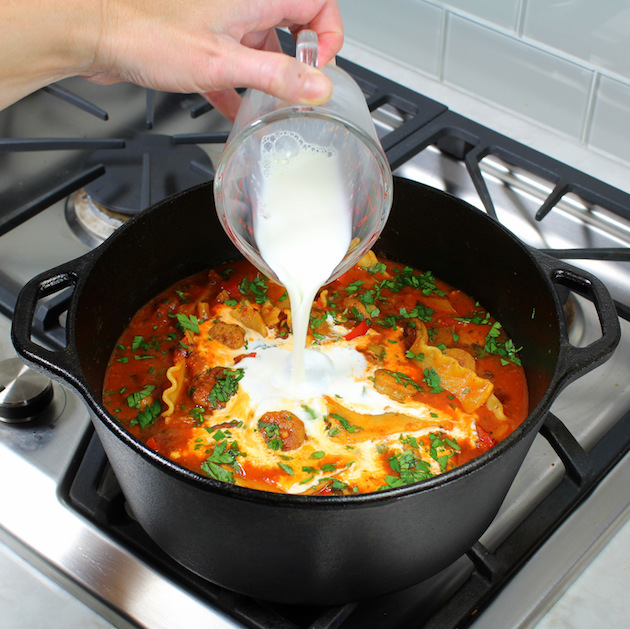 Lasagna soup is 100% going on the must-make list! I love your twist with the chicken sausage! YUM! Can’t wait to try!!! Yay! It’s so good, Kelly! I’m excited for you to try it! And thanks for your kind words! Oh wow! Comfort food at its best, right there! My other half is the biggest fan of lasagna, but he always spends hours in the kitchen preparing it. Your version looks so much quicker and better all around! Cant’t wait to share this with him! I love hearing that, Anna! Thanks so much! I hope you both enjoy it as much as we do! Oh, yeah!! 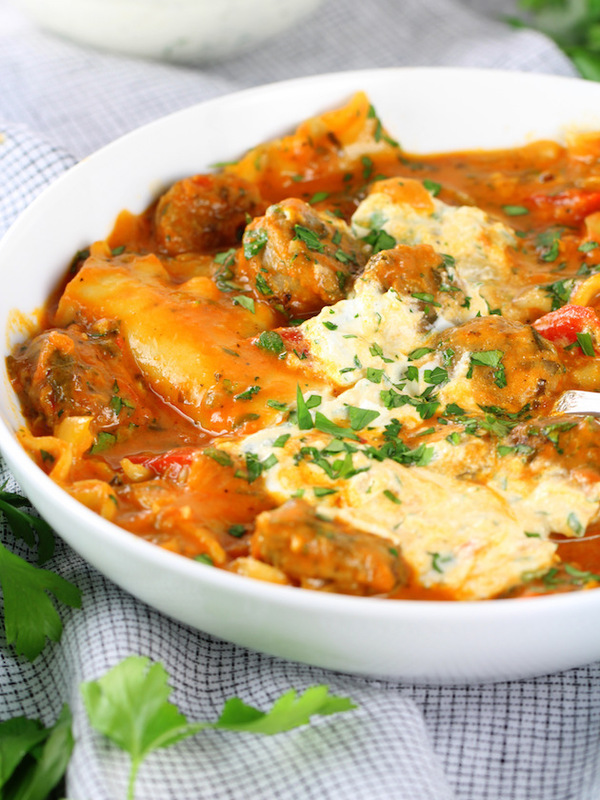 I’m all about easy, delicious and hearty comfort food! This recipe has it all. Thanks for such a detailed recipe! It’s my pleasure, Erin! Thanks for your encouragement! 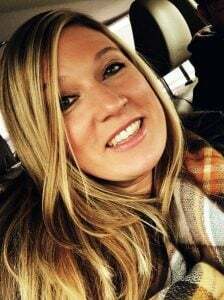 Absolutely, Heather! You have to try this yummy soup! This is calling my name. Look at how nice and thick this soup is. Perfect for the cold, rainy day we are having here. I need to make this for my grandkids! For sure, Gloria! Those kiddos would LOVE this soup! It is a crowd pleaser for sure! I intentionally made it on the thicker side – it just seemed right being “lasagna” soup and all. What a great, comforting meal! Love the step by step picture, makes it really easy to follow! Thanks you, Nicoletta! 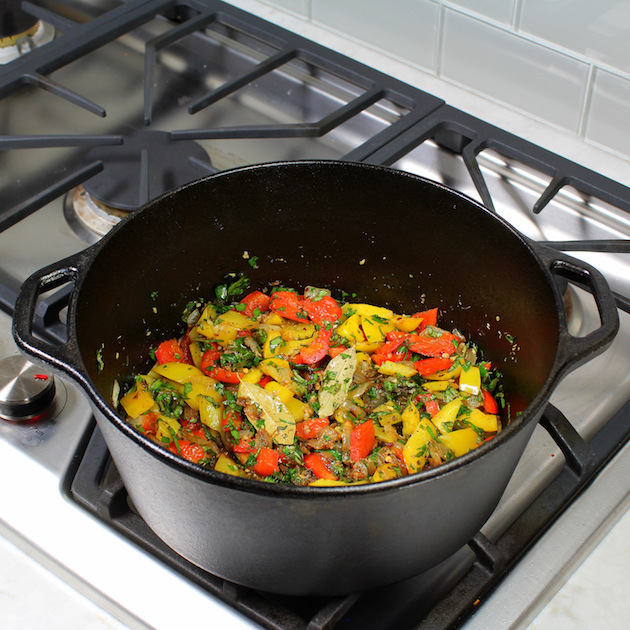 I just love that it’s so hearty and delicious, plus, it’s ready in 30 minutes! Holy moly yum!!!! 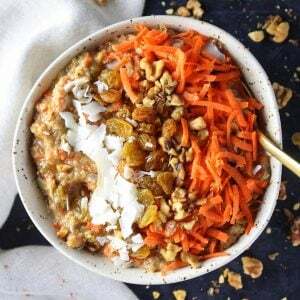 Talk about comfort in a bowl, girl!! I really wish I could reach through my screen and grab a bowl (or the pot, lol). Too good!! Love that response, Dawn! Thank so much! It’s perfect for a cozy meal during cooler months.